Now available with motorized tilt for flexible control of the light distribution even after being installed in-ground. This is achieved through the DMX cabling, meaning the tilt can be controlled from anywhere that suits. A 10° tilt option integral to the luminaire to ensures a flush finish, yet flexibility when illuminating structures. 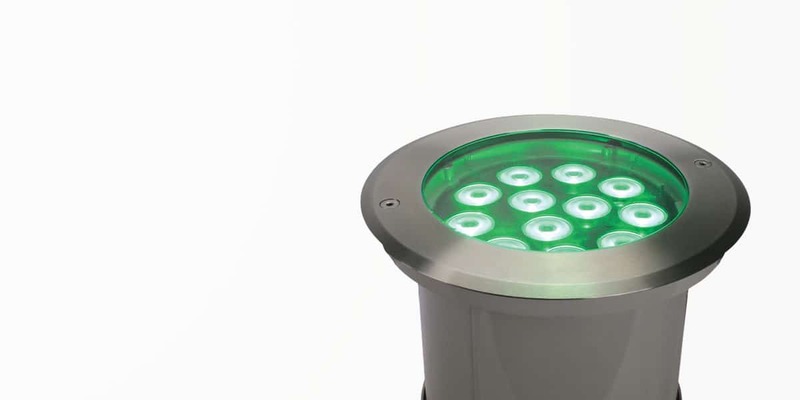 The Chameleon RGBW™ IG2 is ideal for illuminating columns, pillars, walkways, steps or to highlight landscape details and key elements. The Chameleon RGBW™ IG2 uses high brightness RGBW LEDs combined with a state of the art optic system. 180° pan and 10° tilt for flexibility when installing. Highly robust and suitable for even the harshest environments. An IP67 rating ensures high protection from dust and water. Toughened security glass suitable for installation in public areas. The Chameleon RGBW™ IG2 has a flicker free function to ensure a smooth and consistent light output. Control the RGBW colours through a DMX wired controller or wireless control panel.